Darkest of night with the moon shining bright, there's a set goin' strong, lotta things goin' on. The 137th most acclaimed album of all time has an air of great power. The dudes have envied it for so long. Curtis Mayfield's masterpiece is this week's Counterbalance. Klinger: The early 1970s were, if you ask me, the Golden Age of Soul, a time when giants walked the earth (each giant larger than the last). And during this time, it became de rigeur for the R&B auteurs of the day to bring their compositional talents to the silver screen. The results were generally pretty spectacular. Isaac Hayes won an Oscar for his score for Shaft. Marvin Gaye turned the score for Trouble Man into one of the best albums of his career. 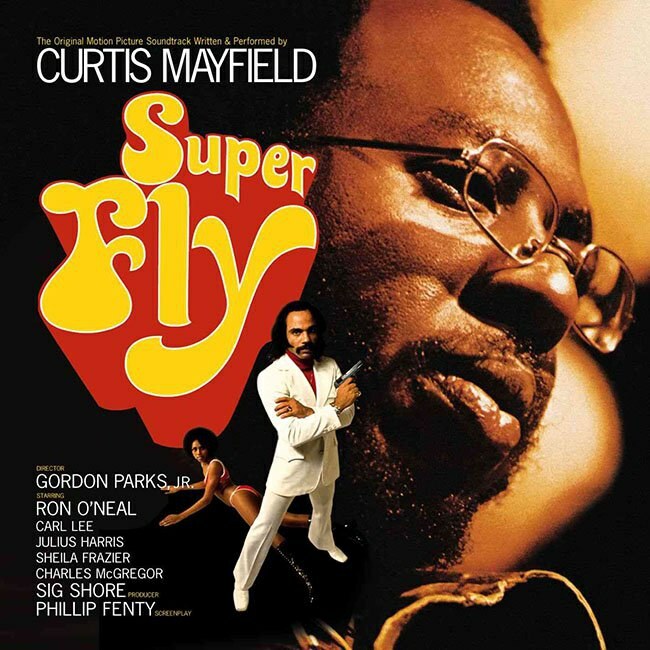 Curtis Mayfield scored what may be the decisive victory, though, with his soundtrack for the 1972 Gordon Parks film Super Fly. According to the now-famous bit of music lore, Mayfield watched the film and was appalled by the actions of antihero coke dealer Youngblood Priest, who was at the film's center. He proceeded to write a batch of songs that shed light on drug dealing's very real repercussions, which he felt the film presented more or less without comment. The result is an album that works on every level. As a soundtrack, it becomes an integral part of the movie, practically a character of its own as it acts as a latter-day Greek chorus. As an album, it's a near-perfect collection of groove and soul, with elements of jazz and traditional film score orchestration. But that's me. I've long been a sucker for Curtis Mayfield's sweet voice and gift for melody, and for my money he's one of the all-time great songwriters. (Exhibit A: "People Get Ready", which is right up there with "Amazing Grace" as far as being a song that it's hard to believe was written by a mortal human being who lived and breathed and watched TV and cut the cheese just like the rest of us—it's just too freakin' beautiful.) What's your take, Mendelsohn? Mendelsohn: Works on every level. Integral part of the movie (and one of the few soundtracks to outgross its own movie). Latter-day Greek chorus. I think you about covered, it Klinger. Might I also add that the title track was later sampled by the Dust Brothers for use in Beastie Boys' "Egg Man" off of Paul's Boutique—hearing those opening eight bars in this context throws me off. I keep expecting Radshach, Mishach, and Abendigo but instead of rhymes about Egg Man, I get Mayfield's excellent critique of Priest and the perils of the drug game. Strictly speaking, Mayfield's version is much more of a cerebral exercise but I still can't help inserting Beastie Boy lyrics into the song during the brief snatches of instrumental bars. Do you have that problem, too, Klinger? Or is it just me and my inability to uncross the wires of popular culture references that fill most of the usable space in my brain? Klinger: Well, that sounds like a question you should maybe be asking a neurologist instead of an amateur Internet wisenheimer, but I see your point. I'm just not sure which came first in my brain. "Superfly" (two words? one word? That's what's messing with my brain right now...) was a top ten hit back in 1972, so there's a good chance that toddler Klinger was hearing it on CKLW while he bounced up and down in the back seat. Was I thinking, "Hey, that's Superfly", when I first heard "Egg Man"? I think so. Did I immediately recognize "Pusherman" when I heard Ice-T's "I'm Your Pusher"? Most likely, but record-keeping from that time is sketchy at best. But as I've been listening to Super Fly over the last few weeks, none of that especially matters. This really is a fantastic record that no samples or covers can really touch. There's an artistry to this album and the genre from whence it sprung that, to my way of thinking, is too often overlooked by critics who seem to have a tendency to view soul music (outside of a few artists like Stevie Wonder) as primarily a singles medium. This could explain why we’ve talked about soul less frequently than I’d like as we take our marching orders from the Great List over at the Acclaimed Music website. The fact that Super Fly is one of only a handful of soul albums we've covered so far seems wrong to me somehow. And as much as I love Mayfield's work, part of the credit for the beauty of this album should go to arranger Johnny Pate. Arranging is kind of a forgotten art form. It can make huge difference in the overall feel of an album. (Frank Sinatra's Come Fly with Me is so awesome because of Billy May. Frank Sinatra's All Alone is kind of crappy because of Gordon Jenkins.) Pate's gorgeous string arrangement at the end of "Little Child Runnin' Wild" says almost as much about the undercurrent sadness and desperation here as the lyrics. Not to mention the awesome "Junkie Chase", which has made many a drive home from work considerably more exciting (although I might quibble that chasing junkies—or being chased by junkies—would probably be a considerably more lugubrious event than this exciting little track would lead you to believe). Mendelsohn: We don't get the chance to talk about arrangers much in the rock 'n' roll world—mostly it's the producer and sometimes the engineer that need to be given a little credit for helping to shape the final product. You are right on about Pate's contributions to this record, without which, I don't think we'd be having this conversation. Obviously, Super Fly (when referencing the movie or the soundtrack, while "Superfly" is the song title. Confused, much?) is Mayfield's vehicle, showcasing his smooth vocals, lyrical prowess and funk/soul bona fides. But you need Pate's contribution to move these songs from stripped down soul numbers into the cinematic quality that makes this record shine. "Little Child Runnin' Wild" is a great example but I would also point to "Eddie You Should Know Better", "Freddie's Dead", and "Give Me Your Love". Pate's contributions to each track mesh so well with Mayfield's material—that jazzy, instrumental breakdown in the middle of "Give Me Your Love" is nearly transcendent. And yeah, it mostly atmospherics but it is the final piece of the puzzle in such an intricate puzzle. It’s kind of a shame that arranging is turning into a lost art. Klinger: Pate and Mayfield had a long history of collaboration, dating back to the early days of the Impressions, so it might be hard to gauge who's responsible for what in terms of musical input. But you know, I think we lost something when started to be more about the beat than the arrangement. Because to me, the funk is important, but it's what goes on at the top that separates the great from the good. And the arrangements on Super Fly (and "Superfly") have the top covered. It's all in the dichotomy that exists here, between darkness and light, between top and bottom. Where the iconic bass line of Joseph "Lucky" Scott meets the bracing percussion of "Master" Henry Gibson. And of course you hear it as the lyrics portray the antihero as someone who's "trying to get over". In the end, does even Mayfield avoid casting much in the way of judgment on Youngblood Priest? It seems that no matter how critical Mayfield was of the movie's themes, he still understood that there were layers that ran deep. There's a lot going on here, which is especially interesting when you consider that the movie was most likely conceived with less ambitious goals in mind. But that's what puts the album here in the upper echelons, it seems. Mendelsohn: Super Fly (the movie) is considered to be one of the high points of the Blaxploitation genre. The movie, much like the soundtrack, is a complicated piece—a mixture of the high and the low. I don't know if it was necessarily made with that dichotomy in mind, but it ended up being an important part of the Blaxploitation genre—a genre that has an immense amount of pop culture cachet with homages showing up in a myriad of places across the all modes of media. Klinger: Oh, don't get me wrong—I get the impact that the genre had, and I'm sure Gordon Parks, Jr. understood the empowering potential of this film (his father had a long, brilliant career as a photographer before directing Shaft). I just meant that it was still at its core a low-budget film aimed at a mass market, and it's the soundtrack that brings an even deeper level of artistry to the proceedings. Mendelsohn: If I was a betting man, I'd lay odds on the soundtrack being the prime mover behind the success of the movie, as well as the key to gaining greater crossover acceptance for the genre in general. The greatest thing about the record is the funk and soul is just a Trojan horse that Mayfield uses to slip by unseen before laying out a greater message—and it's all done in that sweet, sweet falsetto.